you can easily identified one accent park along the road @ seapark there... ahaha. big rim and GT wing. So far i cant find any GT wing which is specially design 4 accent. tat mean i only can install d universal GT wing izzit? do anyone know where can get d nice-nice GT wing ler ? Posted: Tue Mar 27, 2007 2:38 pm Post subject: Need help! Can anyone tell me where to get the car accessories (side skirting, front grille, back bonnet wing and etc.) with a reasonable price in Klang valley preferable in KL or Serdang area. My Accent are fitted with the standard accessories but the RX model are more impressive. The original fitting r very expensive(no budgetlah). By the way can anyone tell me if the fuel saver vavle that KBSC r selling, is it true it will cut down on the fuel consumption? Universal GT wing will do fine. I am also using universal type. Posted: Wed Mar 28, 2007 2:23 pm Post subject: Re: Need help! Did you see my bodykit? its is custom made. Bodykit for whole car (front, side and back) can cost you few hundreds (1000+ without pain) this is because its custom make. do refer to the this site in our forum http://www.myaccentclub.com/forum/viewtopic.php?p=26007#26007 to see my car and 1 of our member's car. The bumper if you want it you can call me up i can order for you at a price of 650 without paint. refer to buying and selling section for more info on the bumper. Hopes this can help you abit. 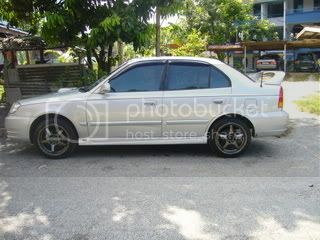 wow..clkwa~ nice bodykits~ i think when MAY i contact u just order for the bumper lor... coz i want install my rims wif bodykits together..~ehehe THX ur help...ur GT wing same wif me ~ U live KL ?? ok..just let me know when u want the bumper than i will order for you. i'm staying in kl... how about you? anyway hope to hear from you soon. my skirting at the back got knocked by dunno who (parked there, went for lunch, come out got it already ) n now one side of it is hanging there in the air. but it's dropping lower n lower by the day because of the rain. so, i plan to change both front and back, just the front and back. saw ur car on LDP this morning... kinda weird how the hell that is happened, now u told the story. the price remain the same, 600 for bumper + 50 for wiremesh + 250 for paint if want. that is for the front. as for the back u can take a look at the link below. the back is custom make. so it depends. If you are interested do let me know. i can arrange the things. can't seem to see the link u posted there. when i click, page not found. thanks a lot. will let u know if i need it. (now still weighing different options and budget). btw, how to let u know? pm u? anybody else who knows of any other "design"? other than those mentioned? can share? what bout choice no2, anybody knows where to get a quotation? You can pm me or give me a call at 012 201 6078 (Alex). you can see my car in the exterior and interior. than you can see a post call "Share your experience and photos on your modified ride" The picture are inside. When fixing up the front lip, need to remove number plate? SG Accent... Anyone know? Just go to custom made lah.....they will advice you.